As a kid, my whole family would all look forward to gathering together to watch The Wonderful World of Disney on TV. Every episode was inspiring, filled with dreams and promises of the wonder of Disney. I dreamed of going to Disneyland one day to experience this promise of a magical land. Many years later, that dream was realised as an adult. But the promise Disney made to me as a kid of a magical land still held true. And it got me thinking, “how many companies keep the promises that they make?” Disney kept his and continues to touch everyone. Every young girl dreams of becoming a princess, thanks largely to Disney. Try imagining a world without Disney, without magic, optimism and childlike-fantasy. The Walt Disney Company was the creation of a high school drop-out who suffered bankruptcy numerous times, and encountered repeated financial and business disasters. How did one man, Walt Elias Disney achieve so much? Walt Disney is best known for developing Mickey Mouse. Yet, behind this man is an amazing leader. Disney with his brother Roy changed the world through animation and created Disneyland, the “happiest place in the world”. Walt was born to Elias Disney, who moved to California in search of gold, but ended up a farmer. Walt developed a love for drawing, dropped out of school, and joined the army to drive an ambulance. At 19, he started his first company called Iwerks-Disney Commercial Artists. However, it soon went bust. Walt decided to get a “real job” and worked at an ad company but was soon fired for not being “creative enough”. Eventually, he started another company, Laugh-O-Grams, which also went bankrupt. Walt went to Hollywood, facing more failures and setbacks in attempts to create a successful cartoon series before finally creating Mortimer Mouse. His wife insisted on changing Mortimer’s name to Mickey Mouse, who went on to stardom, overshadowing then popular Felix the Cat. Walt continued to struggle, even after winning his first Academy Award in 1932. His big breakthrough came with Snow White and the Seven Dwarfs. But his company kept facing financial issues as Walt was always out there chasing impossible dreams. Walt never once gave up sight of his dream to create “the happiest place in the world”. Even in dark hours when Charles Minz, a big film distributor ‘stole’ the rights of Oswald the Rabbit (the character that first put the Disney Brothers on the map) and hired away his top animators, Walt and his brother Roy kept pressing on. Walt was never afraid to roll up his sleeves and get his hands dirty. Years ago, journalist Art Linkletter turned up early for the press conference of Disney’s Fantasia. He found the place empty except for one person who was busily arranging chairs. He asked, “When is Walt Disney supposed to arrive?” Walt grinned and said “I’m Walt Disney”. Walt was always an innovator. In Steamboat Willie, he created the first-ever animated film that synchronised sound. Walt was first to use three-strip Technicolor. He developed a two-story-tall multi-plane camera, later adopted by everyone. He made the first film with Fantasound (an early surround sound-like system), first with CinemaScope (widescreen technology), audi-animatronic robots and the first colour TV programme. Walt was never satisfied, always tinkering, fiddling with new things, seeing how far their capability could be stretched, and then creating something better. What was the secret to his innovation, creativity and imagination? As a kid, I thought Walt Disney was this wonderful fairyland. Later, I realised that Walt Disney was ONE person. Recently, I learnt that Walt Disney was actually three. 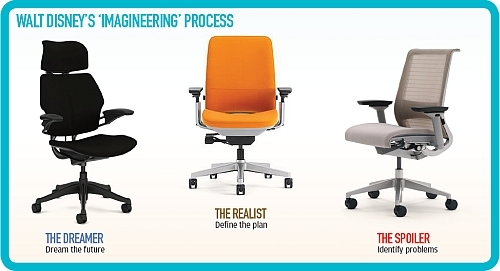 Walt found an approach with his three chairs exercise, calling it “Imagineering”, a term combining the words “imagination” and “engineering”. Walt never stopped dreaming new possibilities. Walt understood that possibilities were only limited by our imagination. And his “Dreamer” chair was for this sole purpose – to sit down with unrestrained creativity, unlimited resources, and questions like “what would I love to create next”, “how would it look like” and “what would touch people’s lives”. · What resources do I have to make this dream happen? · What do I need to do to make it happen? · How will I fund it? · How long will it take? · Who can help to make it happen? · What obstacles will I face and how will we overcome them? In the “Realist” chair, Walt focused on action assuming that the idea could be done. He “felt out the idea” and worked out the idea, the story, the character, the solution. Walt believed, “our work must have a foundation of fact. We must know everything about it. We cannot do fantastic things unless we know what is real and what is not”. Walt subjected everything to rigorous scrutiny. He claims that “every foot of rough animation was projected on the screen for analysis, and every foot was drawn and redrawn until we could say, ‘This is the best we can do’”. The Critic plays a key role in finding loopholes – things that may go wrong and uncovering issues that the dreamer and realist failed to spot. · What are the weaknesses of this plan? · Will a customer really be pleased? · How would this look to an expert in this field? · Is this the best? What would make it better? What’s missing? · Does it achieve what we set out to achieve? The Spoiler critically evaluates the work of the Realist and Dreamer and Walt knew its importance saying “We were growing through self-criticism and experiment. Each year we could handle a wider range of material, attempt things we would not have dreamed of tackling a year before. This is not genius, or even remarkable. It is the way people build a sound business of any kind.” To Walt, his three chairs were just sound business processes. If we aspire to be innovators, we need to have perspective. I found that for each project I work on, consideration of the three perspectives helped take the project to a whole new level. Dream the impossible, then make that dream possible and then see if the critic in you can shred your work by finding flaws. Walt loved people, including his employees and his family, and was a great teacher who pushed his employees out of their comfort zone. Walt had great leadership traits, including his tenacity to never give up and keep pursuing the dream, even in the most horrible circumstances. But most importantly, Walt understood the process of innovation. He knew he needed to be willing to take chances on innovative technologies at an early stage, when others expressed concern. Walt was always optimistic in his convictions because he knew his “imagineering” three chairs exercise had ensured he had considered all the risks and knew exactly what he was getting himself into. Had he been just a “dreamer”, he would have died bankrupt and forgotten. He was fearless, but he wasn’t reckless. Neither should we when it comes to innovation. All we need is three chairs and we can become “imagineers”. What Are Your Leaders Made Of? Let The Non-Partial Assessors Speak!